"What is the most powerful truth you have found in a work of historical fiction?" Then copy your answer in an email to maryhoffman@maryhoffman.co.uk so that I can contact you if you win. We're sorry our competitions are open to UK Followers only. Pineapples are having a fashion moment. Everywhere I look, I seem to see them: on clothes, jewellery and homewares, from shoes to jumpers, necklaces to candle-holders, pots and knick-knacks. It isn’t hard to see why. They are immediately recognisable, brightly coloured and – at this drab end of winter - evoke tropical sunshine and exotic locations. As a design feature, what’s not to love? It isn’t the first time the pineapple has been at the centre of fashion. In the eighteenth and nineteenth century there was a craze for the ‘king of fruits’ – and the reasons for it were very different from today. Pineapples originated in South America. They were cultivated very early, due to the fact that in the right conditions they will fruit all year around. Early western explorers brought them back to Europe – and across to other tropical regions, where they quickly spread - as an example of the abundance and exciting discoveries of the New World. During the seventeenth century, such was their rarity that they were given to royalty as gifts. The symbolism around them – as the king or queen of fruits, as a representation of a new Eden, or of a new tempting ‘apple’, even associations in Catholic countries with the Virgin Mary – quickly grew, as did their reputation as the most delicious of all fruits. 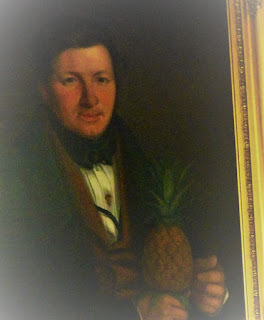 By the early eighteenth century, the quest was on to grow pineapples in Europe. This was difficult – they need a constant tropical air and soil temperature to thrive, and the technology was not initially available. This changed with the development of hothouses, initially in the Netherlands. These swiftly spread across Europe and by the middle of the eighteenth century, it was fashionable for rich aristocrats to have their own ‘pinery’. C18th Wedgewood tea canister, pineapple design. Pineapples became a necessity at the grandest dinner parties and country-house gatherings, crowning a pyramid of fruit as a mighty centrepiece. But such was their expense that they were often left intact, not eaten, and re-used over several weeks until they started to rot. In some places, it was even possible to hire a pineapple if you wanted to impress your guests, although of course it was much better if you could take them on a genteel tour of your very own hothouse. The craze for pineapples went further than just for the fruit itself. They swiftly became used in all sorts of places, on items as diverse as clothing, reticules (small handbags), snuffboxes, wallpaper and crockery. Having your portrait painted with a pineapple also seems to have been a popular choice, as the example below from the Cwmmau Farmhouse, owned by the National Trust, shows. 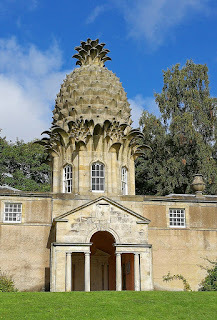 The motif became embedded into architecture, with stone pineapples often decorating the tops of pillars and gates, especially at the entrances to grand stately homes. No-where is this shown more clearly than in the mighty Dunmore Pineapple (which can now be rented as a holiday cottage from the Landmark Trust!) This has led to the supposition that the pineapple was seen as a symbol of hospitality, although Fran Beauman convincingly argues in her 2005 book ‘The Pineapple: King of Fruits’ that for many it was much more about asserting status and conspicuous consumption than hospitality per se. By the mid-nineteenth century, the first imported pineapples started to appear, at much lower prices than the home-grown version. 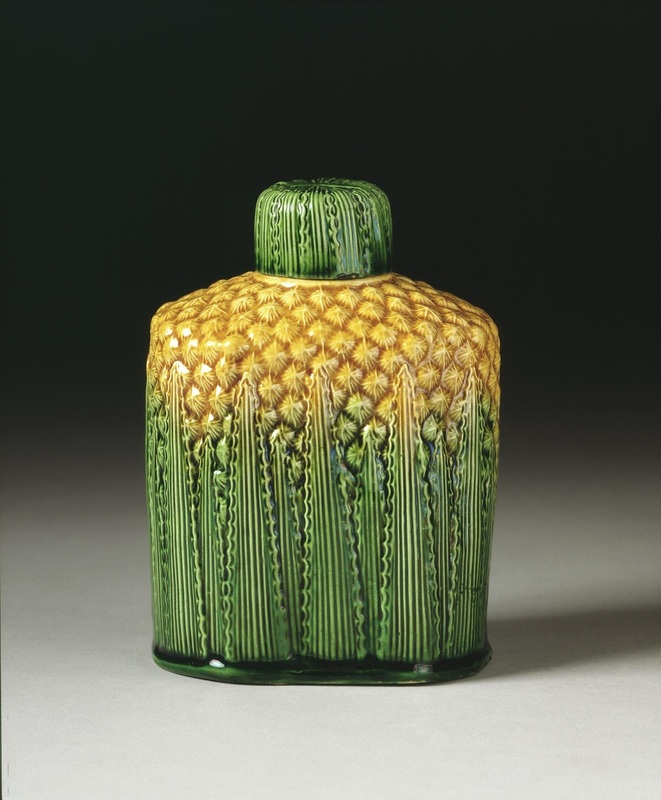 Although this meant that a taste of the fruit was within the reach of a middle-class household for the first time, the fruit was often in poor condition and English pineapples remained a true luxury item for the time being. The advent of refrigerated shipping and improved canning methods towards the end of the century and in the early years of the twentieth, however, spelled the end for the pineapple as a symbol of social cachet. Our guest for March is Elise Valmorbida. Welcome, Elise! Elise Valmorbida grew up Italian in Australia, but fell in love with London. She’s a designer, writer and teacher of creative writing. In recent years, she produced a feature film. Her fiction includes Matilde Waltzing, The TV President and The Winding Stick. 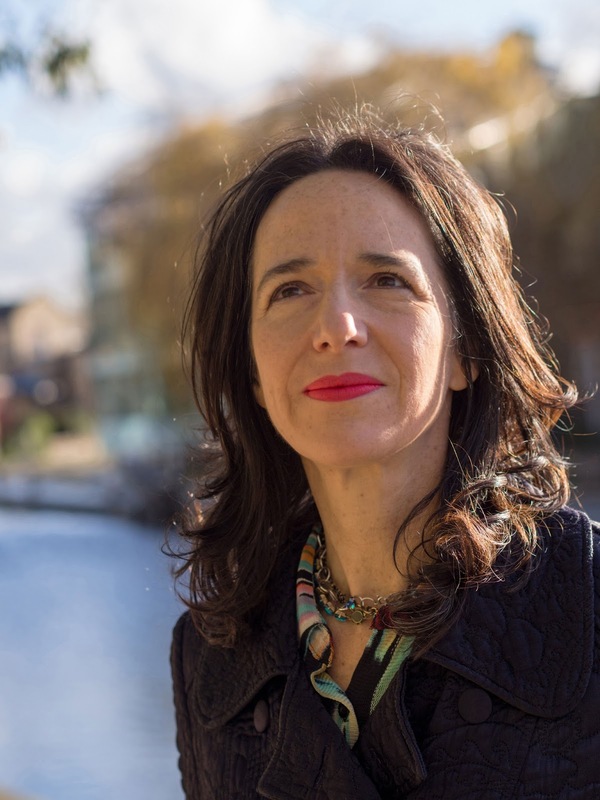 Her non-fiction includes Saxon —The Making of a Guerrilla Film, and The Book of Happy Endings, now published in four languages and four continents. Last year I went to a screening of In Guerra per Amore (At War With Love), the latest feature film written and directed by the Sicilian satirist known as Pif. He also stars in the movie as the sweetly goofy Italian-American who’s prepared to leave USA peace for WW2 Italy—all for love. Renowned for his earlier film The Mafia Only Kills In Summer, Pif is tireless in his pursuit of gangsters, using comedy as his weapon of choice. In Guerra per Amore shows how the American liberators of 1943 not only released—but promoted to positions of real political power—the Mafiosi who’d been languishing in Italian prisons courtesy of the Fascists. This political promotion gave new life to the Mafia, and Italy lives with the consequences today. It’s one of the dark sides of the Liberation, a huge and controversial subject. But discussion at the London Q&A, like too many of the reviews, was waylaid by the issue of the helicopter. What helicopter? There’s a pivotal scene in the film, where a navy helicopter delivers innocent Pif into war-torn Sicily. He is already seated on a donkey in a giant sling. It’s like a stork delivering an absurd baby, and a sly cinematic nod towards the Christ-carrying helicopter in Fellini’s La Dolce Vita. But, some critics point out, the navy didn’t use helicopters during WW2. This is an issue of historical accuracy. Never mind all the other fantastical gestures and inventive flourishes that make up a movie I love. What’s more, this is an issue of transport, and there’s nothing like transport—trains, planes, automobiles, buses, timetables, routes, engine types, bogies, you name it—to get historical hackles up. I’ve never written historical fiction before, although my first novel Matilde Waltzing leans in that direction. I’m a writer of fiction, or non-fiction. I don’t think in terms of genre. 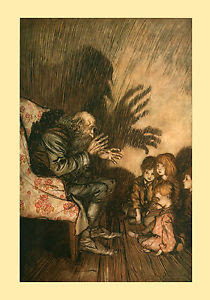 But something happens when a storyteller delves into the past. Suddenly the specialists are out in force, alerting us to the fact that the horses should have been smaller, or that the ladies’ dresses shouldn’t have had bustles. I do understand such concerns. A dropped stitch can unravel the immersive weave of the fiction. But do people get this bothered when aliens from another galaxy speak English? Or when a dog narrates an entire novel? At two Historical Novel Society conferences, years apart, I was struck by how many established writers had become very used to saying, more or less: “I’m not a historian, but I can claim to be a novelist.” Melvyn Bragg noted that Herodotus “made all that up”, that history and fiction have been intermingled from the beginning. Manda Scott talked about hoping to achieve an authentic-sounding, authentic-feeling concept of what might have been, a concept that is “not wholly incorrect”. Eileen Ramsay suggested having a note at the back of your book covering your approach, your fact-and-fiction principles. In non-fiction, you can always say that scholarship is divided over this or that issue. In historical fiction, you have to make a decision and go with it. This applies to the big stuff (how you choose to interpret famous figures and events) as well as the small stuff (how people spoke to each other in an unrecorded remote community). In Italian, there are different verbs for ‘knowing’ a person (conoscere) and ‘knowing’ a fact (sapere)—but the word for ‘history’ and ‘story’ are one and the same word. They are both storia. How vital! It is all the telling of tales. Of course, there is a truth that must attach to some past events—those that are witnessed or documented by a significant number of credible people. And there is concrete evidence, which can be rationally examined and interpreted to create a mosaic of perception. Even so, many voices are unheard, evidence can be lost or misused, and historians do disagree. Then along comes the novelist, who declares from the outset that s/he is making it all up anyway. If only it were that simple! We know that there are rules, the internal logic of the worlds we create. 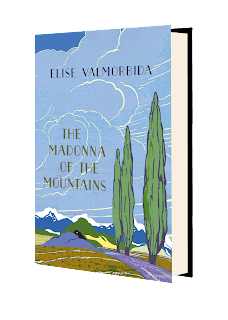 When I was researching The Madonna of the Mountains—set in the Veneto region of Italy, from 1923 to 1950—I found myself thinking that history is written by the victors, and the victors are men. It was easy enough to find out about politicians and campaigns, public figures, mass movements of workers and refugees, the experiences of military men and resistance fighters, the hardware of war… And I certainly didn’t want to get my helicopters wrong. But I wasn’t that interested in helicopters. I wanted to write about the life of a woman. Not one of Mussolini’s lovers, not an aristocrat, not a leader, not a political heroine. 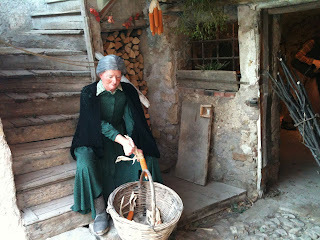 An ordinary peasant woman. Finding out about my protagonist’s day-to-day life was not so easy. Maria Vittoria doesn’t have the education or worldliness to analyse ideology, nor the heroism to overcome pragmatism. And she is of her time. What was important to her? How did she make sense of the violence of her era? How close could she come to self-determination, without taking an implausible redemptive leap into feminism…? This was inviting territory for me, like a landscape of fresh snow. I had a flying start. I grew up Italian in Australia, and as a child I was spellbound by stories about the Veneto and the World Wars. I moved to London as a young adult and started filling notebooks on my frequent trips to Italy with random personal observations and ideas… landscape, weather, architecture, sayings that fascinated me, unwritten recipes, foraging and growing plants for food or medicine. I had no specific project in mind. Over decades, I listened to the reminiscences of elderly relatives, neighbours, strangers—it was like a haphazard oral history project. I heard stories about ordinary people in a very specific time and place. I was given old letters, prayer books, pressed flowers. Cumulatively, it helped me to know a kind of truth, the sort of truth that is difficult to find in history books. 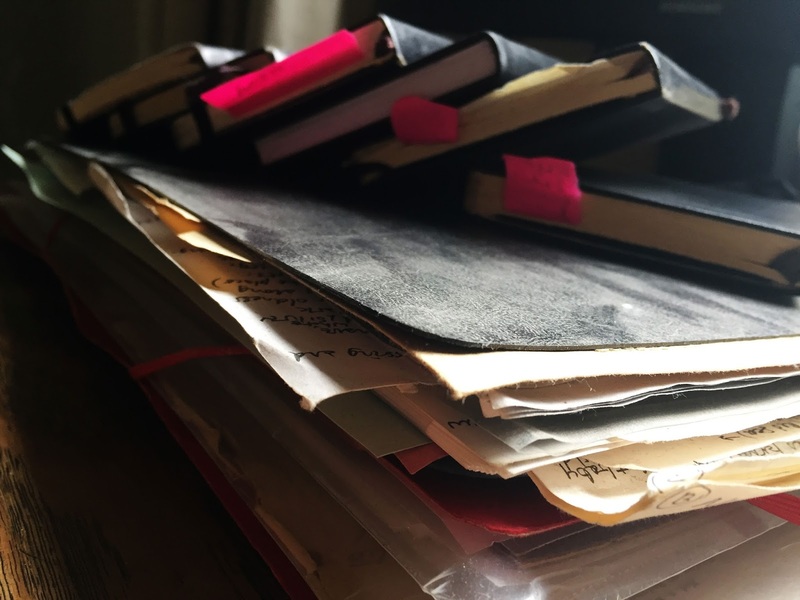 Once the novel writing was underway, my research became disciplined, even obsessive. I read what I could in English, Italian and dialect. I watched countless films. I scoured the internet. I visited churches, museums, cemeteries, historic sites, places that are nowhere on a map. 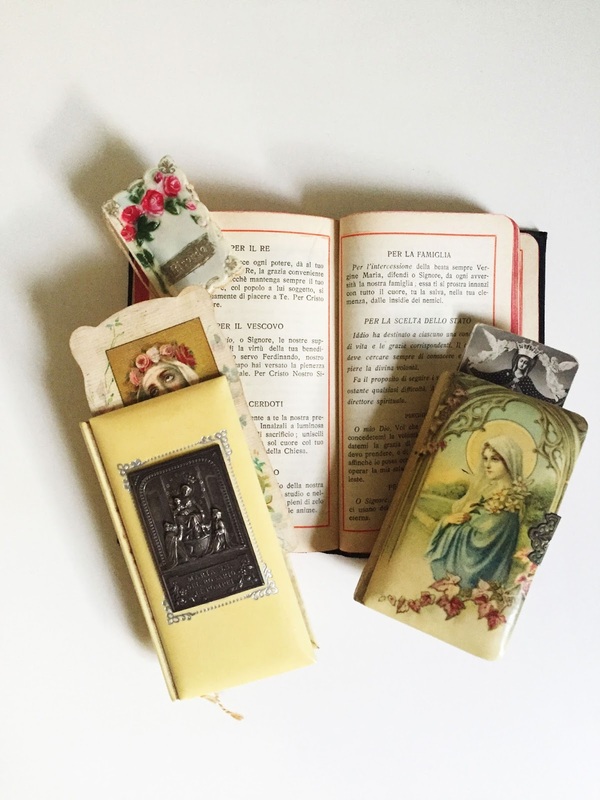 I studied ephemera, from family hand-me-down trinkets, to items for sale on Ebay. In between all that, I did a lot of imagining. I had to. Despite research, despite fragments of real people’s stories, Maria Vittoria’s story emerged from somewhere deep inside me. I’d like to borrow that, with a few swapped names, for The Madonna of the Mountains. Meanwhile, there’s all the other truth for which there is no preface. 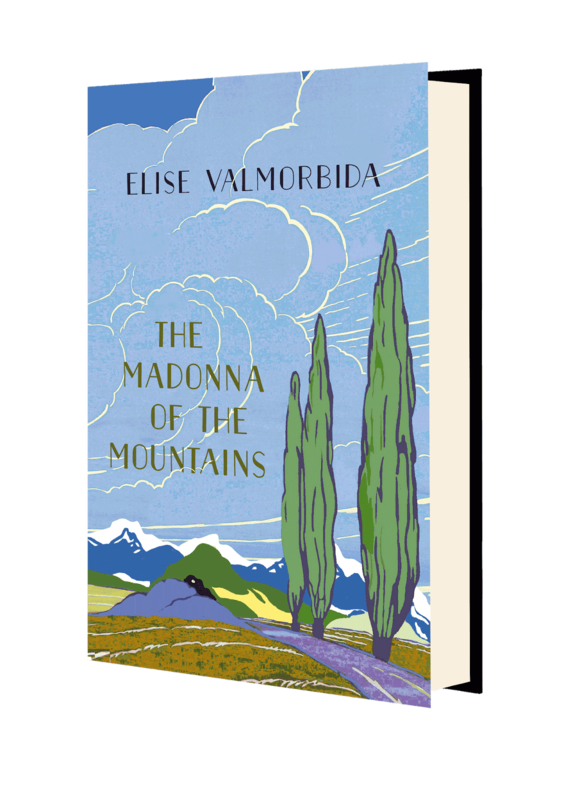 Elise Valmorbida’s novel The Madonna of the Mountains is published in the UK by Faber & Faber on 29th March 2018. Liberty London Fabrics designed the bespoke jacket and endpapers of this hardcover first edition, launching their new partnership with Faber. You can buy the book from Amazon, all good booksellers, or direct from the publishers. Signed first editions are available from Goldsboro Books. In the world of classical music, if asked to name six great composers from, say, 1050 to 1950, most people would probably come up with a list including Bach, Beethoven, Mozart, and could add several others to the list with little difficulty. But if asked to name six great women composers from the same period…? Most of the great composers of the past have been men. Only in the last sixty years or so has it been considered that women could ever become composers. And yet… human nature doesn’t change. Nor does human talent or achievement. It is extremely unlikely that during that period of 900 years there were no women capable of composing music to at least equal that of men. There must have been many prodigiously talented women whose progress in the field of classical music was hindered by lack of expectation, encouragement and opportunity. However, there were one or two whose names shouldn’t be forgotten. 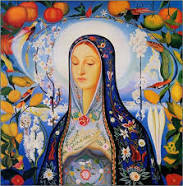 The first really bucked the trend of her time: Hildegard of Bingen (1098 – 1179). 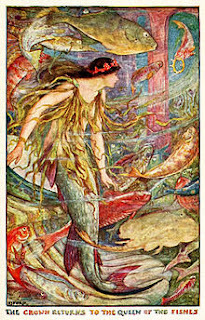 Renowned 900 years ago for her theological, scientific and prophetic writings, Hildegard is best known today for her “unique and glorious” music. For most of her 80-plus years she was shut away in an obscure hilltop monastery in the Rhineland, but she left behind a treasure-trove of illuminated manuscripts, scholarly writings and songs written for her nuns to sing at their devotions. No lack of talent there, then. Today this remarkable woman is recognised as one of the first identifiable composers in the history of Western music (most medieval composers were “Anon”). But there were no mentions of her music in any reference book before 1979 and she barely warranted an entry in the 1990 edition of The New Grove Dictionary of Music. After Hildegard there appear to have been few others to take on the baton for the next 800 or so years – or at least, none whose names have been remembered. Composing music was considered to be purely a male preserve. However, in the mid 18th century two young child progidies toured Europe, performing together as “Wunderkinder”. 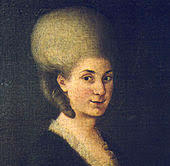 They were Maria Anna Mozart (called Marianne and nicknamed Nannerl) and her younger brother Wolfgang. Contemporaneous reviews praised Nannerl, and she was even billed first - until she turned 18. After that her father decided that although a little girl could perform and tour, a woman doing so risked her reputation. So he took Wolfgang on their next journeys around the courts of Europe, leaving Nannerl behind in Salzburg. She never toured again. But she did not give up. She wrote music and sent at least one composition to Wolfgang and her father – but although Wolfgang praised it and encouraged her to write more, her father made no comment. Sadly, none of her music has survived. We may never know if she destroyed it, or if some of it has survived but been wrongly attributed to her brother. Fanny Mendelssohn (1805 – 1847) was a German pianist and composer, composing over 460 pieces of music. 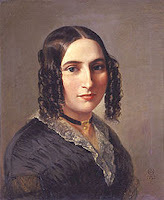 Several of her songs were originally published under her brother, Felix Mendelssohn’s, name, but again she was limited by the attitudes of the time towards women. These attitudes were apparently shared by her father, who was tolerant, rather than supportive, of her activities as a composer. In 1820 he wrote to her “Music will perhaps become his [i.e. Felix's] profession, while for you it can and must be only an ornament". In an era when women, apart from singers, almost never performed in public or composed, Clara Schumann did both. As a pianist she distinguished herself as the foremost interpreter of her husband Robert’s work, but she was also a primary force in reintroducing eighteenth-century keyboard music to the public. Unfortunately, her own compositions remained unknown until the second half of the twentieth century. Many are still unpublished and owned by private collectors, so we still cannot appreciate the full extent of her compositional achievements. During their marriage, Clara was pregnant ten times and bore eight children. However, even with such a large family, Clara continued to perform, compose, and teach piano, while at the same time she supported Robert and his career. Schumann encouraged Clara’s composing and contracted publishers for her, but made it clear that his creative work took priority over hers. Cécile Louise Stéphanie Chaminade (8 August 1857 – 13 April 1944) was a French composer and pianist. Born in Paris, she studied piano and violin and music composition, despite her father’s disapproval of her musical education. At the age of 8 she played some of her own compositions to Georges Bizet, who was much impressed with her talents. She gave her first concert when she was eighteen, and from that time on her work as a composer gained steadily in favour. She wrote mostly character pieces for piano, and salon songs, almost all of which were published. Ambroise Thomas, a fellow composer and Director of the Paris Conservatoire, once said of Chaminade: "This is not a woman who composes, but a composer who is a woman." In 1913, she was awarded the Légion d’Honneur, a first for a female composer. She was a contemporary of Dame Ethel Mary Smyth, DBE (22 April 1858 – 8 May 1944) Dame Ethel was an English composer and a member of the women’s suffrage movement. She was born in Sidcup, Kent, the fourth of a family of eight children. Her father, John Hall Smyth, who was a major general in the Royal Artillery, was very much opposed to her making a career in music. Undeterred, Ethel was determined to become a composer, studied with a private tutor, and then attended the Leipzig Conservatory, where she met many composers of the day. Her compositions include songs, works for piano, chamber music, orchestral and concertante works, choral works, and operas. In recognition of her work as a composer and writer, she was made a Dame in 1922, becoming the first female composer to be awarded such an honour. She received honorary doctorates in music from the Universities of Durham and Oxford, and died in 1944 at the age of 86. Nowadays, fortunately, women composers are less rare, which one hopes is because of the change in attitudes among the general population, as well as among the musical elite. 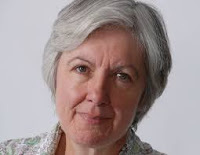 There is still a long way to go, but at least now we have the likes of organist and composer Judith Weir, who in 2014 became the first female Master of the Queen's Music. 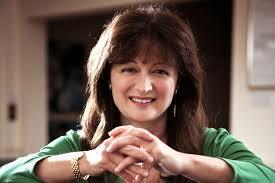 And Debbie Wiseman, who writes music for films and television, and is the resident composer for Classic FM. It is to be hoped that they and their fellow-female composers will never become forgotten women. One of the joys of living in Oxford is the annual blooming of snakeshead fritillaries, or fritillaria meleagris, a historic flower. They appear in the first week in April, sometimes a bit later, but don’t be fooled if you can’t spot them. You can wander into a meadow where they were last year and think you are too early. Then suddenly there is one right under your nose. 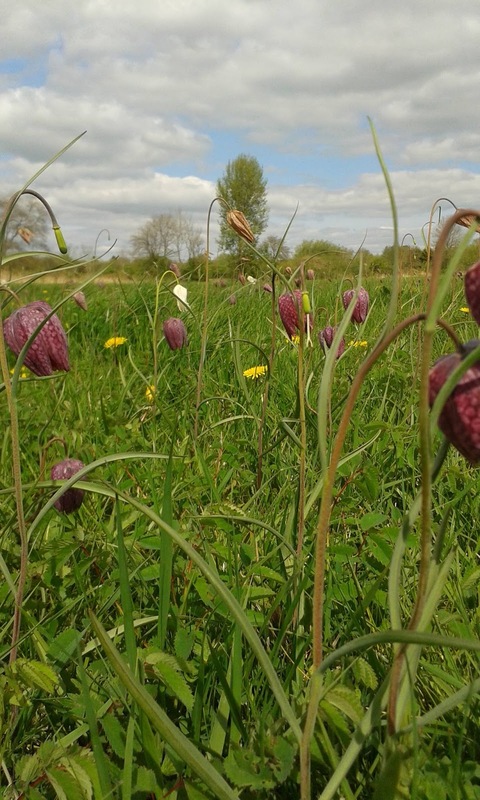 Snakeshead fritillaries have the magical property of being invisible until you get close, and then suddenly there are thousands round you. The best way to view them is to lie down among them and look through them up to the sky. Admire the bell-shaped silhouette of the flower against a (hopefully) blue sky, and smell the fresh spring earth. Individually, the flowers are extra ordinary and somehow too exotic to be growing wild in Britain. The petals are tessellated in dark purple and pale pink in a geometric checkerboard fashion, as if a graphic artist has drawn each one separately. Inside is a bright orange stamen where you may spot an early bumble bee pollinating the flower. And en masse they are spectacular: a blurred haze of purple sweeping over a green meadow of fresh new grass and yellow dandelions. You may also hear a cuckoo, who lay their eggs in reed warbler’s nests in the surrounding water meadows. A member of the Liliaceae family of the genus Fritillaria, they are herbaceous perennials with slender stems and lance-shaped greyish-green leaves. Their habitat is damp meadows at altitudes up to 800 m (2,625 ft). The word Fritillaria comes from the Latin fritillus meaning dice-box, probably referring to the chequered pattern on the flowers. Meleagris means "spotted like a Guineafowl" and "snake's head" refers to the snake- shaped flower heads nodding on their long stems. Some of the flowers are pure white. The bulb, about 2 cm in diameter, contains poisonous alkaloids. They grow about one foot above the spring grass which then masks and protects them as they shed their seeds, to germinate for next year. An exotic combination of a snakeshead, a guineafowl and a dice box. Fritillaria meleagris is native to Europe and western Asia. In Croatia, the flower is known as kockavica and is the country's national symbol. The Swedish name, kungsängslilja means ‘Lily of King’s Meadow’ which is where it grows in large quantities in Sandemar Nature Reserve in the Stockholm Archipelago. They are known to have been around for at least 7,000 years but the flower is increasingly endangered as ancient water meadows disappear. 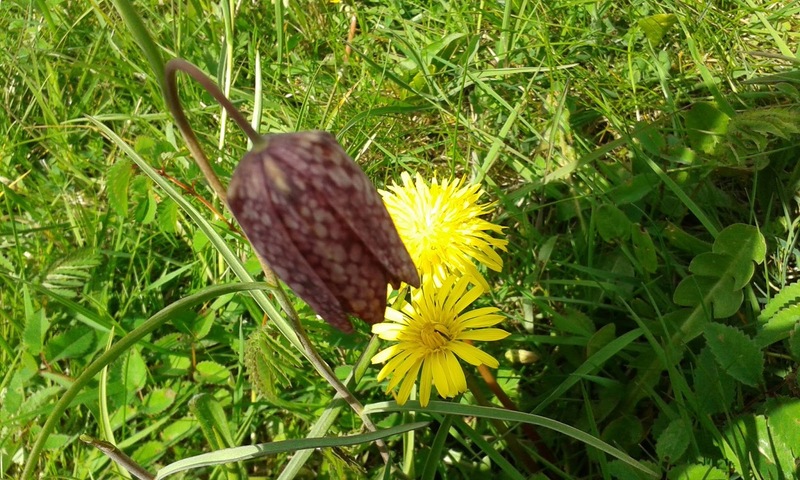 No-one is sure whether the fritillaries in Britain are indigenous or were introduced by horticulturalists and then spread into the wild. The plant was first described in the 16th century by herbalist John Gerard who knew it as a garden plant. Not until 1736 was it recorded in the wild, so some people claim it must be an escapee. However, it does not easily spread from damp meadows to adjoining land,which means that it could be native and became isolated when Britain was cut off from mainland Europe after the last Ice Age about 12,000 years ago. 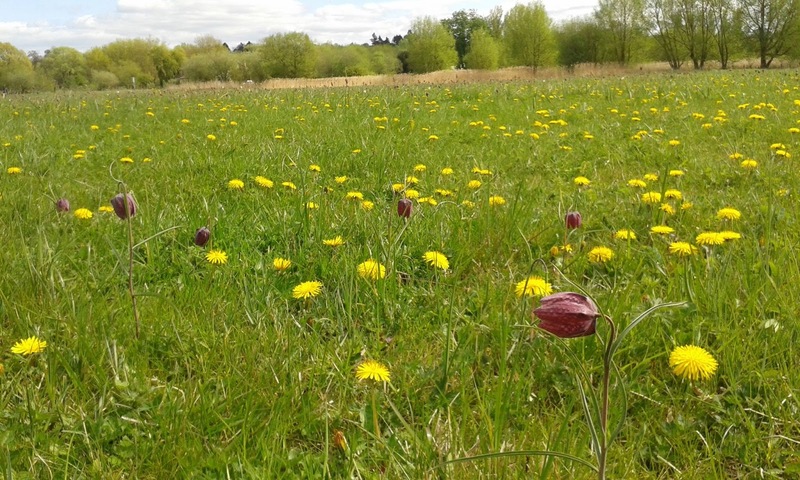 Dandelions grow among Snakeshead Fritillaries in Iffley Meadow, Oxford. You can grow them yourself from bulbs. Fritillaria meleagris thrives in moist, well drained soil. Plant the bulbs 10cm (4") deep and 10cm (4") apart in a damp spot in your garden, with plenty of well-rotted manure or garden compost. In Britain, there are now only a handful of meadows left in the Midlands and the south of England. You can find them at North Meadow and Clattinger Farm nature reserves in Wiltshire; and Fox Fritillary Meadow and Mickfield Meadow in Suffolk. 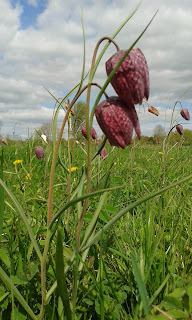 They can still be found in Botley war cemetry meadows, Oxford ; and the Oxfordshire village of Ducklington holds a "Fritillary Sunday" festival. After a poll in 2002, it was chosen as the county flower of Oxfordshire. The plant was once so common in the Thames Valley and parts of Wiltshire that it was picked in vast quantities and sold in the markets of Birmingham, London and Oxford. But most of the plant's habitat was destroyed when ancient meadows were ploughed up during the Second World War to grow food crops. At this time of year, Magdalen College meadow in Oxford is filled with the fritillaries which have been here since at least 1785. Once the flowering is over, deer are moved in for the summer and autumn. Their cloven hooves tread in both the seeds and their fertilizing droppings - a perfect combination. Around the edge of the meadow is Addison’s Walk, lined with mature beech, chestnut, yew and lime trees. It is a beautiful and tranquil walk, favoured by students, dons and local historians. My favourite place, however, is Iffley Meadow beside the River Thames on the edge of Oxford. Every year they are counted, and last year there were 75,508 plants – up from 500 in 1984. 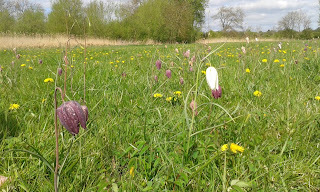 Also in the ditches around Iffley Meadow are king cups, dragon flies, reed and Cetti’s warblers, and cuckoos. After all that strenuous flower-watching, pop into the 19th century Isis Farmhouse on the Thames Towpath. There is no road leading to it – you have to walk or cycle there, but it serves home-made cakes, often accompanied by live jazz. This time last year, I posted a blog about Cowslips or Concrete. Sadly, despite huge opposition from local residents, Oxford City Council decided that cowslips are not important. First they cut down the flood- preventing willow trees, then they bulldozed the soil, burying the wild flowers. The use of all this gravel and tarmac? To store flood equipment! 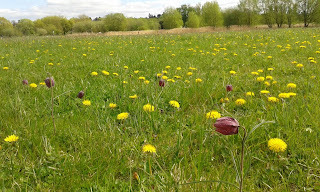 This what the cowslip meadow in Marsh Park now looks like. "When I dream of an afterlife in heaven, the action always takes place at the Ritz, Paris." Ernest Hemingway wrote. I wonder whether he would offer the same opinion today, or perhaps he would consider some of the latest episodes in this new era of the Ritz as definitely worthy of a novel. I am not quite sure why I should have been on the list, but a few days ago I received an email notification informing me that the Ritz in Paris is selling off at auction a large collection of furniture, bathroom accessories, lights and decorations from the hotel's past. The hotel has recently undergone a four-year renovation, closing for the first time in its history between 1st August 2012 and June 2016. The renovations cost in the region of 220 million dollars and are the first since the late 1980s. will take place from 17th to 21st April at the Artcurial headquarters on the Ronds-Points des Champs-Elysées, 8th arrondissement, Paris. I shan't be attending or bidding. However, I am fascinated by the history of this iconic hotel. The Egyptian, Mohamed Al-Fayed, once owner of Harrods, has been the Ritz's proprietor since 1979 when he bought the hotel for 30 million dollars. During this time, it is has been stained with one or two scandals. Jonathan Aitken, former Conservative Member of Parliament in the UK, was jailed for perjury after a long drawn out trial and public investigation into his stay at the Ritz in Paris while Lebanese and Saudi Arabian arms dealers were also residing there. In January of this year, three armed men entered the hotel by a service door, used hatchets to smash hotel jewellery stands and broke into a store within the hotel, grabbing watches and various other valuable items. The men threw the loot out to two others waiting outside with a motorbike and a car. The trio within the hotel were apprehended while the two outside escaped with some 4.5 million euros worth of luxury goods. The three suspects were swiftly charged while the two who had escaped let go the bags of stolen goods and made off, according to a spokesperson for the police. The Paris authorities did manage to recover all the stolen jewellery. The Ritz is, of course, where Princess Diana and Dodi Fayed, son of Mohamed Al-Fayed, ate their last meal in the Imperial Suite before their fatal car accident on the night of 30th August 1997 in the Pont d'Alma. 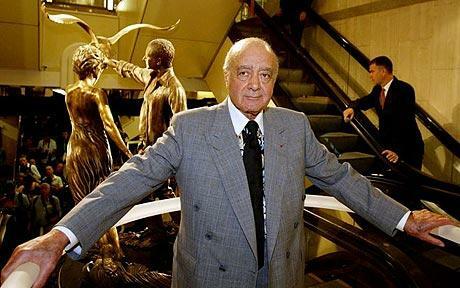 Al-Fayed in front of his memorial to his son and Princess Diana. 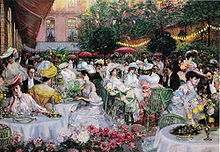 Ritz garden terrace (1904), Pierre-Georges Jeanniot. The first of two paintings Ritz garden paintings by the Swiss-French artist. From 1909, Proust found himself a spot in this garden to write sections of Le Temps Perdu, Remembrance of Things Past. Today, the hotel has a Salon Proust. In earlier incarnations, the reputation of the hotel on Place Vendôme was a little less dubious than it has been of late and was certainly full of glamour and style. It was founded by the Swiss hôtelier, César Ritz, in collaboration with, as a junior partner, the French chef, culinary king, Auguste Escoffier. They met at the Grand Hotel in Monte Carlo where they were both working. The Ritz opened its doors in 1898. It was one of the first hotels in Europe to provide en suite bathrooms. It also offered telephones in the rooms and electricity and within a short time, by the turn of the century, had certainly established itself as an address of luxury, grand luxe. When César Ritz died in 1918, his son Charles inherited the hotel and it was only at the time of Charles's death in 1976 and a short period of decline that it was sold to Al-Fayed in 1979 who immediately embarked on its first renovation, which took ten years and was achieved without closing its doors. Over the years, the hotel has played host to the rich, the famous and fashionable society. Cinema stars, royalty, heads of state and artists. Scenes from three films that star Audrey Hepburn were filmed at the hotel. Fitzgerald, Hemingway - in 1988 the famous bar was given his name. I have to confess it is a bit of thrill to go and sit there and sip a cocktail. 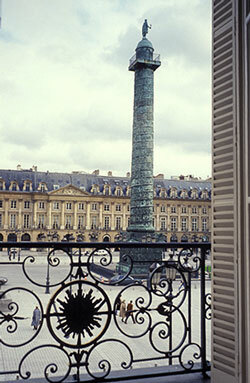 Coco Chanel made the hotel her Paris home for thirty years and died there. I have read that along with the hotel's renowned barman, Frank Meier, in 1925 Coco also created the Mimosa cocktail which was inspired by the scented flowering of the mimosa trees in the south of France where she had built a home. The spa at the hotel is the world's first Chanel Spa. Chanel skincare products are used in the treatments. During the Second World war, from 1940 onwards, it was the headquarters for the German Luftwaffe along with their chief, Hermann Goring. Of course, the adjective 'ritzy' and the noun 'ritz' as in 'putting on the ritz' are born from the elegance and opulence this hotel has become synonymous with. Today it is a member of the Leading Hotels of the World, boasts a staff of over six hundred and is considered by many to be Europe's finest. It is one of the very few hotels in France to claim Palace status, which means a 6, rather than 5 star rating. I cannot, alas. If you wish to attend or participate in the auction, take a look at the Artcurial website. I will content myself with slipping in from time to time, wandering its elegant public areas and treating myself to a drink. Last Christmas I went to a candlelit carol service at St Bartholomew the Great and was struck by the beauty and age of this Romanesque church. How did it survive both the great fire and the Blitz? I decided to learn more about the history of this stunning church and the great teaching hospital next door - which turns out to be a microcosm of a thousand years of London life. Unfortunately, I only have enough space here to whizz through the centuries. Both the church and the hospital were founded in the 12th century by Rahere, a courtier and jester at King Henry 1’s court, who later became a priest. 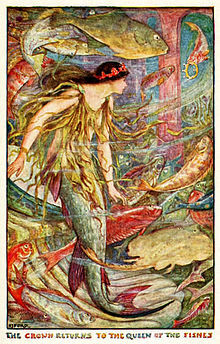 It may have been the death of the king’s wife Matilda, followed two years later by the drowning of the heir to the throne, Prince William, in the White Ship disaster, that changed him so profoundly. On a pilgrimage to Rome Rahere fell ill and saw a vision of St Bartholomew, who told him he would get better and must found a hospital ( the foundation legend of Bedlam, or the Bethlem Royal Hospital, is very similar).This story intrigued Kipling, who wrote a poem called Rahere and made the mysterious holy fool a character in Rewards and Fairies. 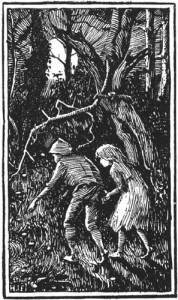 Rahere also appears in Rosemary Sutcliff’s historical novel for children, The Witch's Brat . He became Prior of the Augustinian church he founded and is buried there. In an annual ceremony a rose is laid at the foot of Rahere's tomb, traditionally by a member of the nursing staff at Barts. The modern entrance is in Little Britain, through this 13th century arch with a half-timbered gatehouse above, which leads to the churchyard. The original priory was much bigger and grander. After the Dissolution of the Monasteries, the nave and transepts were pulled down and part of it became a parish church. Some of the lady chapel was incorporated into a private house and the rest of the building was used, at various times, as a stable, factory and blacksmith’s forge. Traces of this can be seen in the church, like this curious, very domestic looking window. In the parish church William Hogarth, that great observer of Londoners, was baptised. It was at Barts that William Harvey conducted his research on the circulatory system. He was appointed Physician Extraordinary to James I and, In 1628, published his seminal work, De Motu Cordis et Sanguinis in Animabilus, which described for the first time the circulation of the blood as a complete closed circuit with dual components. When the plague hit London in 1665 the doctors “retired to the country.” But a remarkable woman called Margaret Blague, who was theThe Matron at Barts and was also the widow of a Barber-Surgeon, stayed in the hospital. She continued to nurse the sick and, surprisingly, survived to live until 1675. 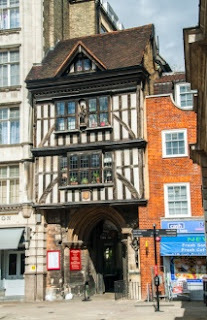 The following year the Fire of London was finally halted at Giltspur Street, where the entrance to the outpatients’ department now stands, and is marked by a golden statue. This is the glamorous cover of Sir Arthur Conan Doyle's A Study in Scarlet (1887). Sherlock Holmes, whilst using the laboratories at The Hospital, is introduced to Dr Watson, an alumnus of the Medical College. In the most recent incarnation of Holmes on the BBC, Benedict Cumberbatch threw himself from the roof . The hospital, like the church, is well worth visiting. Just inside the main entrance on your left is the charming little parish church of St Bartholomew the Less, where Thomas Bodley, founder of the Bodleian library in Oxford, is buried and where Inigo Jones was baptised. Hogarth’s paintings,The Good Samaritan and Christ at the Pool of Bethesda, are on the magnificent staircase that leads to the Great Hall and there is also a very interesting medical museum. Female medical students were finally admitted to the Medical College in 1947 and, the following year, the hospital became part of the NHS. Through all these centuries the great meat market of Smithfield swirled around the church and the hospital. Animals were slaughtered here and executions also took place, including that of of William Wallace in 1305. For four days every year Bartholomew Fair was held on Smithfield, a cloth fair that developed into a wild carnival. Bartholomew Fair, a panoramic comedy by Ben Jonson, shows the vivid life of the fair, from pickpockets and bullies to justices, prostitutes and aristocrats. It was all too much for Victorian sensibilities and in 1855 Bartholomew Fair was abolished. PURBECK MARBLE AND THE MIDDLE AGES by Elizabeth Chadwick. figure in the brown skirt at the back!). Purbeck Marble, is not actually a marble, but a sort of limestone that can be polished and is characterised by being composed of the tightly packed fossil shells of the water snail viviparus carinfer. It comes in a wide variety of shades including blue-grey (as in the columns of theTemple Church) red-brown and green. The vein of this limestone is between 18 and 24 inches thick and was quarried from the surface. 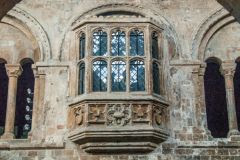 As a building and embellishment material it was very highly prized in the Middle Ages. It could only be obtained from one place and that was the area around Corfe on the Isle of Purbeck in south-eastern Dorset, hence the name. It did have rivals and substitutes such as stone from Tournai, or more local Petworth Marble, but by 1200, Purbeck was the material of choice. During the medieval period from 1170 and through to the mid 16th century, Purbeck was highly prized and thousands of architectural objects were crafted by the marblers of Purbeck and London. The aforementioned columns at the Temple Church are a fine example (although the current ones are replicas and a second set of replacements following bomb damage in World War II). William Marshal's tomb effigy is carved from Purbeck Marble. There was once a fine Purbeck fountain that stood outside the private apartments at the Palace of Westminster. In the 12th century, Henry of Blois, Bishop of Winchester and brother to King Stephen used Purbeck for wall shafts, capitals and bases at Wolvesey Palace, and also for elaborate collonettes at Hyde Abbey. The cloister shafts at Canterbury Cathedral are Purbeck marble, as is King John's tomb effigy. Working the marble was tricky because of its density and its craftsmen had to be experts. It was not usually worked in fine detail because of the difficulty, and only the expert master marblers had the skill. Purbeck was successful in part because of the coastal location of the resource, which made transportation easy. In 1175, columns were shipped from Corfe to Durham Cathedral. Capitals and bases went to Norwich, to Westminster, to Vale Royal. In 1375 a ship called the Margarite out of Wareham was listed as transporting cargoes of Purbeck to London, including two high tombs for the Earl of Arundel, and a large slab for the Bishop of Winchester. 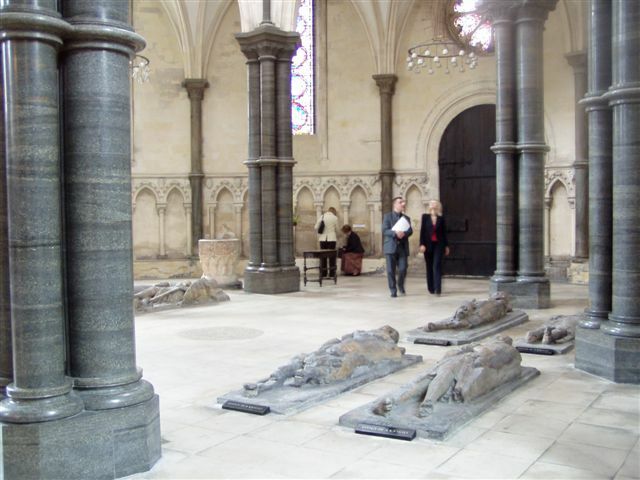 In 1386 the same ship transported Purbeck from Dorset to London for the tomb of Edward III below. The London crafstmen of Purbeck orginally came from Corfe but settled in their own community in the capital. The biggest influx of craftsmen seem to have arrived during Henry III's drive to build and beautify Westminster Abbey from 1245. By 1253 there were 49 marblers at work on the site, all cutting and polishing the Purbeck blocks and shafts. It is likely that there were marblers at work on other cathedral sites such as at Salisbury. The latter was sending worked marble down to Southampton in 1231-2. The most successful Purbeck items for the mass market during the 12trh and 13th centuries were tomb slabs and effigies and these can be found in numerous locations round the country. 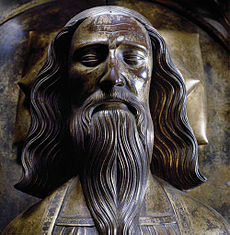 William Marshal, Henry bishop of Winchester, King John, Hubert Walter Archbishop of Canterbury, Giles de Bridport, Bishop of Salisbury, Edward III. Purbeck marble continued to be in high demand during the fashion for effigies depicting funeral brasses as it was used as handsome background slabbing to offset the brass. It also continued to be used for panelled tomb chests and large canopied wall tombs. Today, Purbeck is no longer quarried on former sites except for specialist projects for restoration - as in the case of the heat-damaged Temple Church columns. Elizabeth Chadwick is an award winning best selling author of historical fiction set in the Middle Ages and a member of the Royal Historical Society. Her novel Templar Silks, the story of William Marshal on pilgrimage was released on March 1st 2018. This is the signpost that fascinated me when we first came to live in this area. I guess we were driving home from Watlington Hill, where we might have hoped to see the then-rare red kites. But it took some while before we felt we had time to make the detour to go and see this thing. When we went, we were not disappointed. 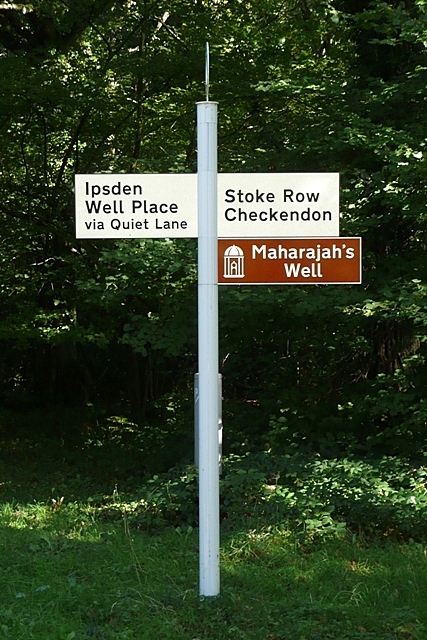 Nowadays, charities often install wells in what we call the developing world, and certainly India was the focus of such activity in the nineteenth century. 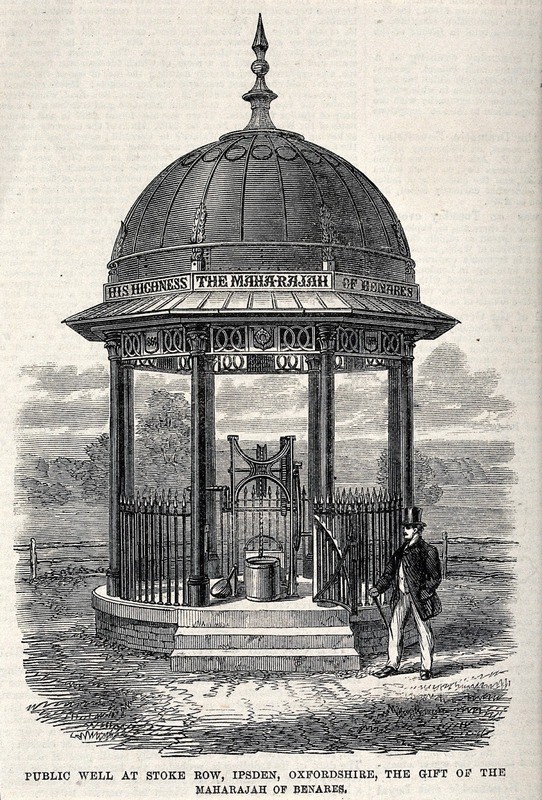 In 1831, Mr Edward Reade, the squire of Stoke Row in the Oxfordshire Chilterns and Lieutenant Governor of the North Western Provinces, was chatting to his friend the Maharajah of Benares about water shortage problems. I can understand the problem; though the Thames runs at the foot of the Chilterns, they are dry, chalky, clayey hills, and there are few streams. There are springs, but they dry up in summer and are capricious, appearing in one place for a few years, then disappearing again. 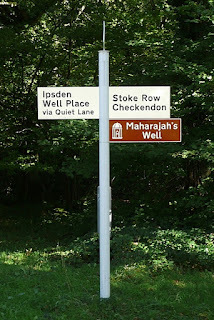 And so the Maharajah set up a charity to help the people of England. That in itself is extraordinary, and salutary, I think, for we always think of charity going out of Britain to the global South. The Maharajah had been educated in England, and he was fond of the country, and fond of Mr Reade, apparently. That's how the people of this rural Chilterns village found themselves with this edifice in their midst. To get to water, the engineers had to dig through twenty-five feet of clay and gravel subsoil (I know them well, under the thin topsoil of my garden), and then through three hundred feet of chalk, interspersed with two layers, about eight foot deep, of sand. After that they got to a mixture of chalk and shells, and to groundwater at last. There was usually fifteen to twenty-five feet of water in the well, and the daily yield was estimated at between 600 to 700 gallons of water. 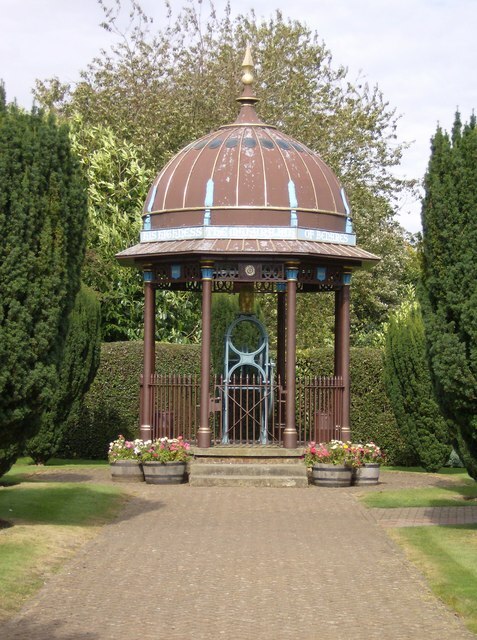 There were two buckets, one which came up as the other one went down, which were operated by the big, delightfully Victorian mechanism underneath the canopy. What is missing on the print I've posted here is the elephant, which we have been taking small grandchildren to see for years. The exotic structure is no surprise to them, but it must have been for the villagers. It does look as if a small seaside bandstand had decided to decamp to the Chilterns. Another sight for the grandchildren is the Well Warden's cottage, a tiny little octagonal house, which looks only suitable for dolls, yet two couples were among the Well Wardens. It was finally extended in the 1980s, adding on a bedroom and a bathroom. It's still amazing that anyone can fit into it. There is also a cherry orchard. Some of the trees have gone, but it's still reasonably well populated. This was an Indian custom: well keepers could make money from selling the fruit, which was used to maintain the well. The Cherry Orchard was bought for two hundred pounds. Women used to go up the high ladders and pick the cherries and people used to come out from Reading in charabancs to see the cherry blossom in spring, and in the summer to buy the fruit. In the cherry season someone would be there from dawn onwards with a pop-gun or a rattle, to scare the birds away. Only cows were allowed to graze in the orchard, because they are sacred in India. In 1906, mains water was first brought to parts of Stoke Row from Woodcote, and gradually, every house was served. It didn't taste as good as the well water, but nor did one have to walk to get it carrying two buckets on a yoke. It was also hard to turn the windlass, partly because the cable that pulled the buckets up was getting rusty. The cable was taken away during the Second World War. The well was restored, as a monument, at the beginning of the '80s, shortly before we came to live in the area. I can imagine how lovely the water must have tasted, because our water, though it's supplied by the water company, comes from local springs at the top of the hill. Thames Water then put chlorine into it, but when filtered, it is delicious. I wouldn't want to have to carry well water home in buckets, though. We take water so much for granted, but all one has to do is to travel in a country where it's not readily available to realise how wonderful it is to have it piped into our homes. 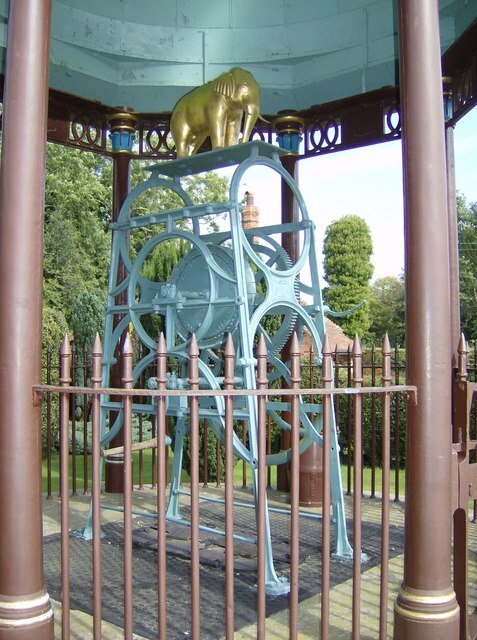 All the same, the Maharajah of Benares's Well represented a major technological advance, and a huge improvement in the lives of the people of Stoke Row. 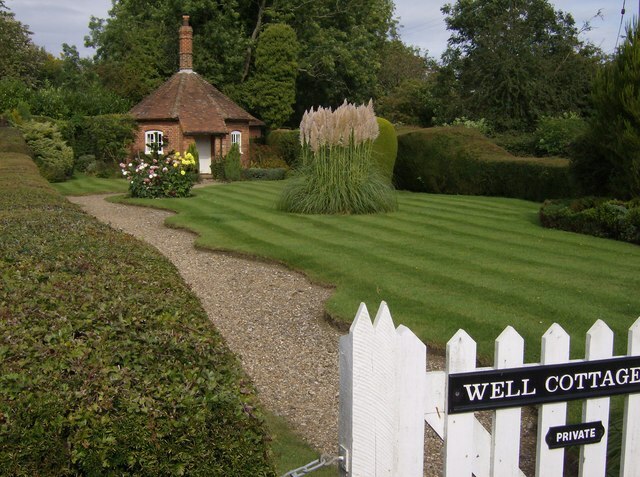 I have got the information and quotes from Angela Spencer-Harper's book 'Dipping into the Wells', which was published in 1999, a fascinating mine of information about the people who once lived in two Chilterns villages, Stoke Row and Highmoor.